Portable tree stands don’t come cheap, at least in many cases they don’t. Fortunately, that rule doesn’t apply in this situation since the Ol Man Steel Tree Climber is an affordable unit that could even speak to the requirements of beginning hunters. It’s convenient, easy to use, and easy to carry around, and we’ll do our best at detailing its most important features below. If you want to be able to pick a good vantage point apart from your hunting friends so that you can go after your dream buck all on your own, this tree stand will definitely prove its worth in most situations. Also, if you usually hunt alone or if you hate hunting from the same spot time and again, this type of portable alternative definitely suits your needs. This lightweight tree stand allows you to benefit from excellent portability since it weighs in at just 29 pounds. It measures 22 by 6.5 by 36.5 inches, and we’d argue that the size is reasonable considering that it should never be too small so that you can sit in it in a comfortable manner. In short, with this alternative, you can enjoy the freedom of choosing whatever tree you want since all you have to do is unfold the stand and set it up conveniently. As its name suggests right off the bat, this product is crafted from steel. On the one hand, you have the advantage of it being able to stand the test of time so that it serves you for as many hunting seasons as possible. This means that you will be spared the expense of another tree stand that you’d probably have to purchase if you were to go for a lower quality alternative. The steel construction also renders it reliable when you’re shifting in it. Without a doubt, you are going to do just that after sitting in the tree stand for an hour or so. Luckily, the steel design will allow you to remain safely put. Another aspect that needs to be taken into account is that this product is outfitted with a mesh seat in which you can sit for as many as several hours without feeling any discomfort. The foot rest pads are fine and they’re sizeable enough to allow you to focus on your target instead of trying to adjust your body position time and again. Additionally, it comes with two padded rails, but you can remove one if you find no use for it so that you can maneuver your weapon of choice as best as possible. The seat measures 18 by 32 inches, so it is one of the biggest in its line. An area where this particular tree stand really shines is its quiet design. Based on the claims of the manufacturing brand as well as the reviews it has garnered from actual hunters, once you set it up and sit in it, you can forget about it. It will definitely not scare off your prey, unlike many other of its competitors, which seem to be made poorly on this account. It’s often that tree stands are designed for one purpose and only one type of hunting. Naturally, if you were to benefit from one that can suit several applications, it would be far better. What do you know? This one can do just that. You can set it up with the classic straight bar or you can install it with the reversible foot rest/gun rest. This kind of design will allow you to get the most out of your purchase and obviously, it will make the tree stand offer good value for the money. 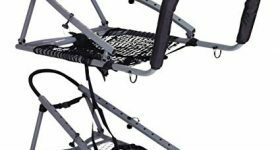 Since most of the manufacturing companies that make tree stands nowadays are focused on providing hunters with as many safety features as possible, you’ll find that this particular one doesn’t disappoint in this sense, either. Some buyers actually argue that the extra safety measures are almost comical since they are rarely required. 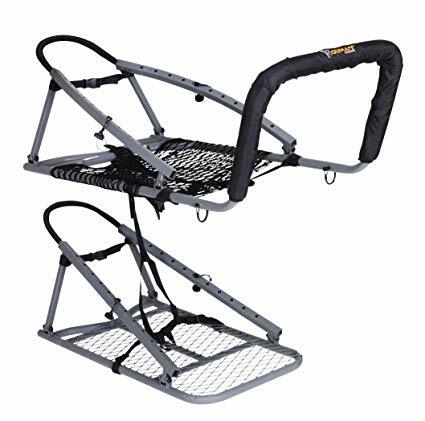 For example, the strap connection hardware comes with a safety pin and a screw, the seat is equipped with netting plus straps that run under it, and these might make its operation cumbersome. All in all, this tree stand seems to be worthy of your consideration since it doesn’t force anyone to break the bank, it has a weight capacity of 300 pounds, it’s made of steel, and it comes with every safety feature you might want from it.